A Little Spring Cleaning Will Make the A/C Happy! 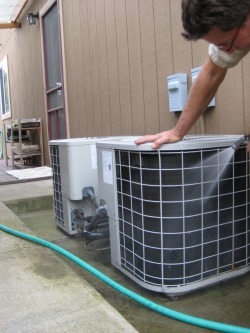 Aside from your system's air filtration needs, an excellent way to improve the performance and reliability of the A/C is to wash the condenser coil with a good spray of water. 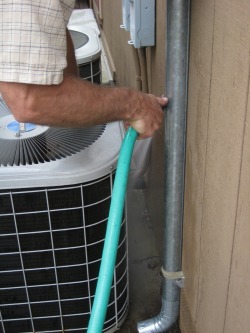 When a neglected coil is cleaned, your air conditioner can more easily reject heat it removes from the air in the house. A cooling capacity increase of 10% is not unusual, and electrical consumption will decrease as well. Since these units are made to sit out in the weather, they don't mind getting hosed down. 1/22/2011 - I've got some work to do on this! Check back later for other HVAC Tips. This is usually where the heaviest buildup of debris is found.